“Ajumma, you didn’t need to prepare this much, you’ll break the table’s legs!” is a common expression one might overhear at restaurants or (minus the ajumma) at young couples’ housewarming parties when the chef has prepared so many side dishes that the table may break with the weight of food. Meant as a compliment and a sign of appreciation, ajummas will usually shrug it off with a smile as if it were nothing. Feasts of this kind are not rare in Korea. The amount of side dishes vary only according to price and specialization (in restaurants) or occasion (at home). The tradition of hanjeongsik, a full-course Korean meal with an array of side dishes, had its beginnings as a meal of the well-to-do, kings and emperors in their royal palaces, and aristocrats in their spacious homes. In particular for the former, hundreds of servants would be charged with the task of preparing and serving these elaborate meals. As Michael Pettid points out*, given the amount of attention that was given to such a complex formalized system (positions held by specific people for specific tasks such as the preparation of tea, tofu, etc. ), it is not surprising that the foods of the royal palace during the Joseon dynasty (1392 – 1897) have achieved the reputation of being at the zenith of Korean cuisine. Hell, even entire K-dramas revolve around the cookery of the royal court, such as Jewel in the Palace (2003/2004) about Seo Jang Geum, a girl from the working-class caste who manages to get a tough job as a kitchen apprentice in the royal palace. While historically an abundance of dishes in any one sitting was reserved only for those with means, the appreciation of an elaborate meal has roots that go deeper than any current trend. Although a dozen or more side dishes (as a king would have had) are not the norm in most restaurants, people are very much used to being served at least a few – as part of the meal of course. It’s how mums would do it at home by preparing batches of fermented foods in advance to use for several meals, and that’s how it’s done in restaurants as well. Reflecting on Korean restaurants in London, sadly this is one exciting aspect of Korean food culture that has not travelled and arrived well on the British isles. 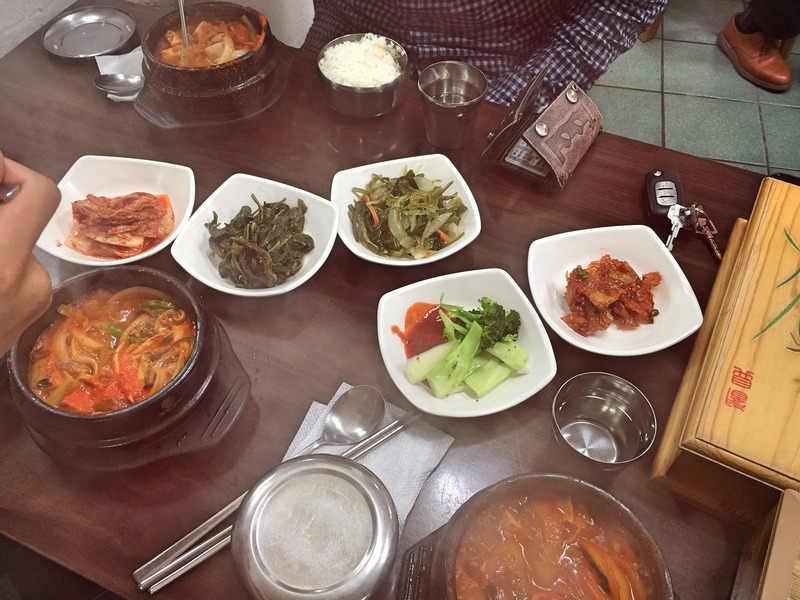 Even in New Malden, the Koreatown of London, restaurants have stopped including side dishes in ordered meals, instead listing a rare few of them on their menus for a not insignificant price. This may have something to do with a different eating culture and different expectations when it comes to food. Side dishes are about sharing. That way everyone gets to have a little of everything. But it’s also about building closer ties by sharing something as intimate as food, something which literally becomes a part of oneself. 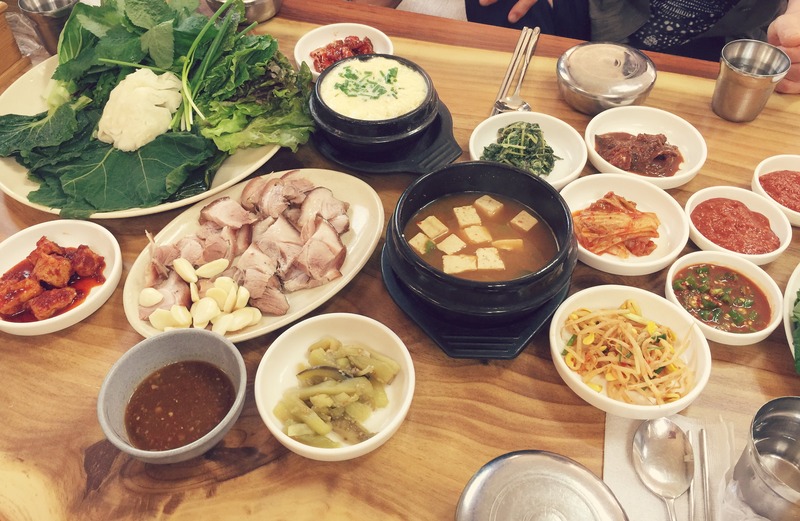 It is interesting to see that this side dish culture is not something we may immediately think of or be aware of when projecting our own image of Korean food. 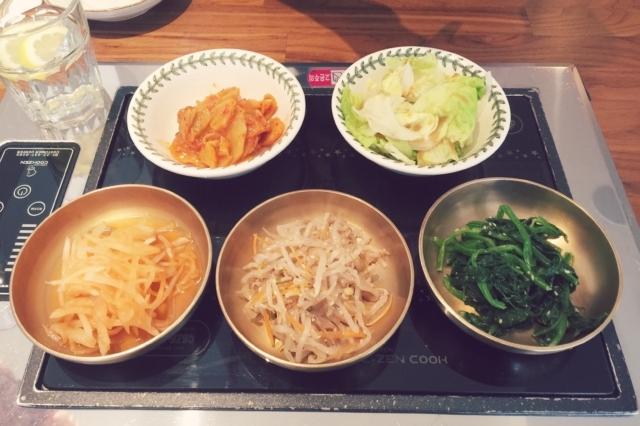 Particularly in the UK, Korean restaurants have adjusted their marketing strategy and business model according to what customers commonly want, and this rarely includes a selection of side dishes. After all, it makes some customers feel uncomfortable as to whether they ordered incorrectly and we may fail to see the point of what seem like bland bean sprouts and a little spinach. And sharing? Perhaps another time. For many restaurants serving side dishes in Central London they never were, and, in places like New Malden, no longer seem to be viable as a free-of-charge accompaniment. 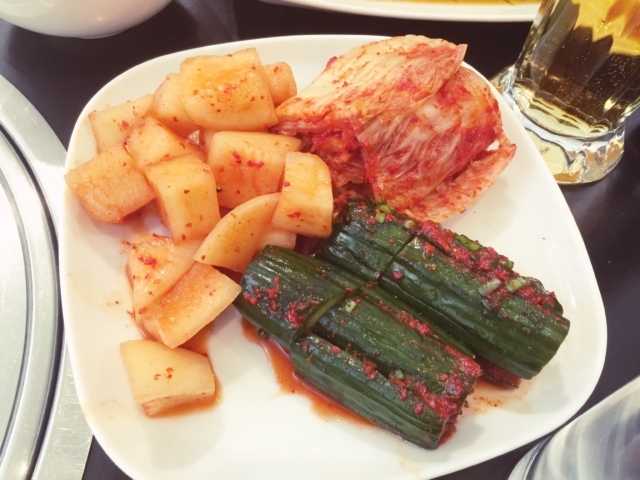 But there are ways to get a hint of Korean eating culture, by simply ordering kimchi or namul at restaurants. They will usually come in threes. Order a couple and break a table! Or make Korean friends and go with them. Or the best option yet, consider a trip to South Korea. *Pettid, M.J. 2008. Korean Cuisine: An Illustrated History. London: Reaktion Books, p. 131. An informative and easy to navigate website, Babette, which I think fills a gap for those looking for something off the beaten track, both geographically and gastronomically. All the best to Dae Won, and good luck for both your ventures.